Israeli tanks move in to protect the country's dead settlers. JERUSALEM—After decades of bitter conflict and the loss of thousands of innocent lives, Israeli and Palestinian forces clashed once again this week, with each side laying claim to a five-mile stretch of desperately needed cemetery space. Fighting over the disputed territory, which is located on the easternmost border of the Gaza Strip, has thus far resulted in more than four dozen casualties. According to sources, the swath of cemetery space is being called the rightful burial home of both the Israeli and Palestinian people. "Israel has always been the deathplace of the Jews," said Moshe Abrahim, a religion professor at Bar-Ilan University. "My father was killed here, and his father and mother, and both of his uncles before him were killed here. To have this area occupied by Palestinian bodies is an insult to our great history." An Israeli soldier looks out over a field of disputed holes. Added Abrahim, "I'd sooner die than give up my God-given grave." The first episodes of violence over the narrow strip of cemetery began early Monday morning when a Palestinian suicide bomber detonated himself outside of a Jewish mausoleum, leaving one dead and outraging hundreds. In response, Israel launched a series of swift air strikes, destroying six Palestinian funeral homes and killing an estimated 15 pallbearers. Unfazed by the counterattack, Islamic extremists vowed never to surrender, and said they would continue to perish "for as long as it takes." "So many martyrs for almighty Allah and His blessed prophet Mohammed have sacrificed their lives so that we might someday lose ours," said Ali Akhtar, leader of the terrorist organization known as Islam's Undertakers. "Palestine will not rest until each and every one of its sons has a place beneath this glorious land. Our day of victory is at hand!" Since Monday's attack, violence has erupted across the disputed region, with Islamic radicals throwing rocks and launching mortar fire at approaching Jewish hearses. Fearing that the prized graveyard would be lost to a surge of Palestinian bodies, Israel reportedly took action, sealing 500 soldiers inside military coffins and placing them in strategic tombs. 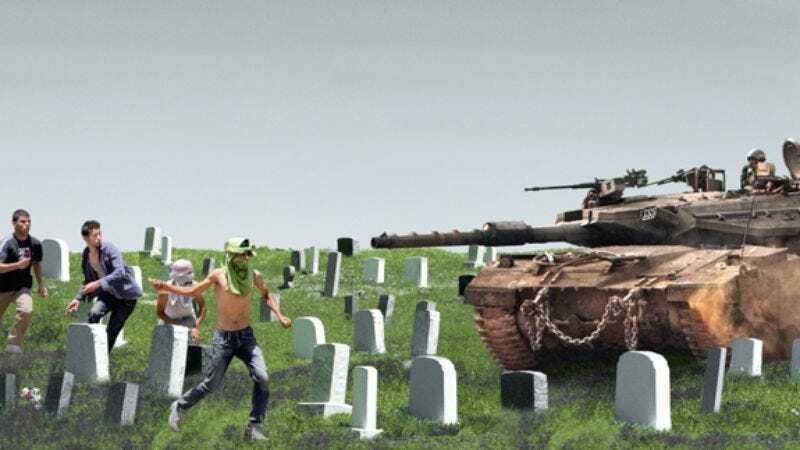 Israeli troops have been ordered to stand their ground and remain interred indefinitely. In a press conference Wednesday, Prime Minister Ehud Olmert said that the state of Israel was doing everything in its power to prevent Palestinians from being buried inside the cemetery, including setting up security checkpoints to inspect suspicious vehicles for shovels, tombstones, and embalming fluid. Olmert, however, would not respond to questions about whether Israel had overstepped its boundaries during an incident earlier this week that saw four Palestinian octogenarians detained on suspicion of being "on the brink of death." As is often the case in the region, innocent civilians from both sides have borne the brunt of the fighting. Asalaa Bahiya—a recently dead Palestinian woman—was repeatedly fired upon by Israeli soldiers after her body was spotted entering the disputed cemetery. In addition, a young Israeli cadaver was captured by Islamic militants, blindfolded, and dragged from a nearby Jerusalem morgue. "How could God have allowed this to happen?" said Yitzchak Meltzer, a grieving Tel Aviv resident who watched helplessly as his firstborn son was driven from his grave by extremists. "To have to rebury your own child—it's a parent's worst nightmare come true." Though some hold out hope for the day when Israeli and Palestinian citizens are buried side by side in peace and harmony, all attempts to bring the conflict to a close have so far failed. A United States–sponsored peace plan that proposed dividing the cemetery space directly in half was dismissed as unjust by both sides, with each claiming it was entitled to the entire graveyard. Likewise, a compromise solution to cremate all deceased citizens was rejected by Israel as "barbaric." With bodies mounting on both sides, members of the ruling Hamas Party released a statement Monday suggesting that the violence could continue for years to come. "As long as Israelis continue to age, decline in vigor and strength, and ultimately pass away, never will their nation know the meaning of peace," the statement read in part. "Either they stop dying at once, or prepare to suffer the consequences."